The cadence of my breathing is a great indicator of how hard I’m running, indicated by the rate at which I inhale and exhale a full breath. At the beginning of every training run and most races (except the shorter ones), I run a 4/4, which means that I inhale during four strides or foot strikes and exhale during the following four. I can usually carry this pattern for about four miles at race pace and then I switch to 3/4 (inhale for three strides, exhale for four), then to 3/3, and so on until I reach what I consider to be my last gear: 2/2 (though there have been some last-minute sprints where I breathe at 1/2). In most half marathons, I hit the 2/2 breathing threshold between miles 8 and 10. So far, the earliest I’ve reached 2/2 was at mile 5 at the 2010 ING Miami Half Marathon. So why was I at 2/2 before even the first mile marker at this race? There are two reasons for this: my activities prior to racing and the actual race course. In order to properly explain the former, we’ll have to backtrack a bit to March 17, 2011. A group of my friends and I went to eat dinner at Burger Bar and Jason brought up the topic of spring skiing. Thanks to his bottomless trough of Starwood points, he suggested going to Colorado for a weekend of mid-April skiing on a budget. A week later, he sent an email to a small group of us and in 24 hours, enthusiastically booked a free room and cheap flights. Although the trip would be thirteen people shy of the excursion I organized in early January, excitement levels were up and the weather looked promising. It definitely helped that we got lucky with the dates: we coincidentally booked flights for Beaver Creek’s closing weekend. This is what the majority of slopes looked like. Coming down the mountain are Nick, Steph and Jason (in that order). We arrived at the Westin in Avon just past midnight on Thursday after the requisite Good Times food stop and narrowly avoiding a speeding ticket. 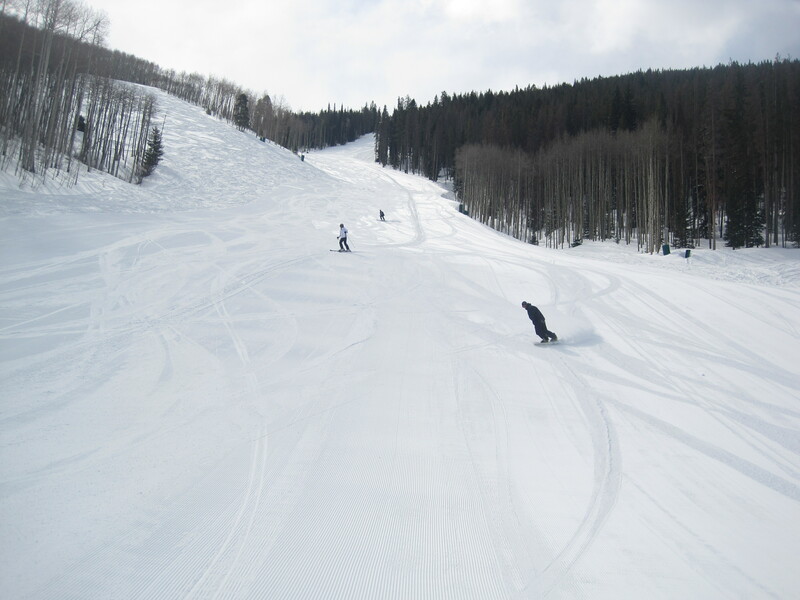 Friday was spent at Beaver Creek, enjoying a dramatic mix of perfectly groomed snow and sheets of unyielding ice. 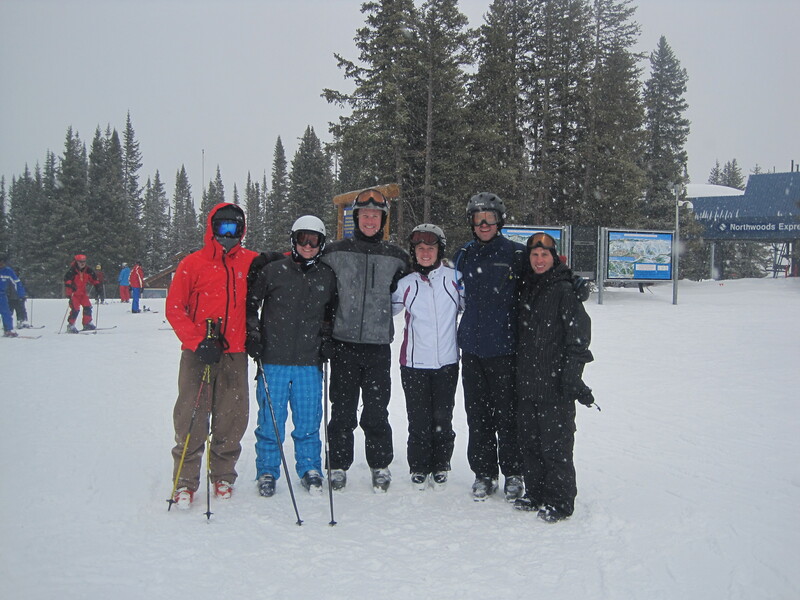 But what impressed me the most wasn’t the range of snow conditions, but the paucity of visitors. It felt like going to school on a Saturday and walking normally crowded hallways with an almost unsettling solitude. But with the waits for lift lines reduced to near zero, how could I complain? I asked a lift operator if this dearth of skiers was normal. She said yes, because everyone is sick of winter by mid-April. Well, Colorado’s impatience can be damned because the timing served us very well. 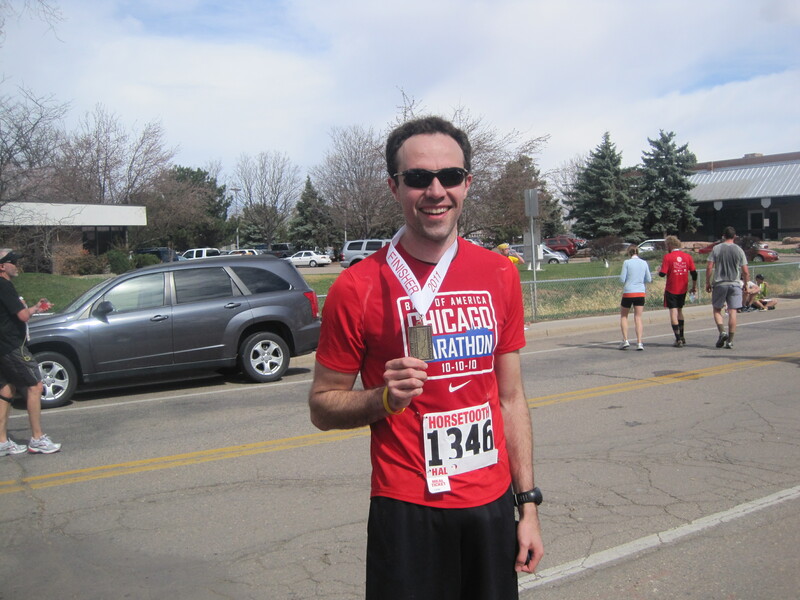 But I personally got doubly lucky with timing by finding a half marathon for that Sunday. 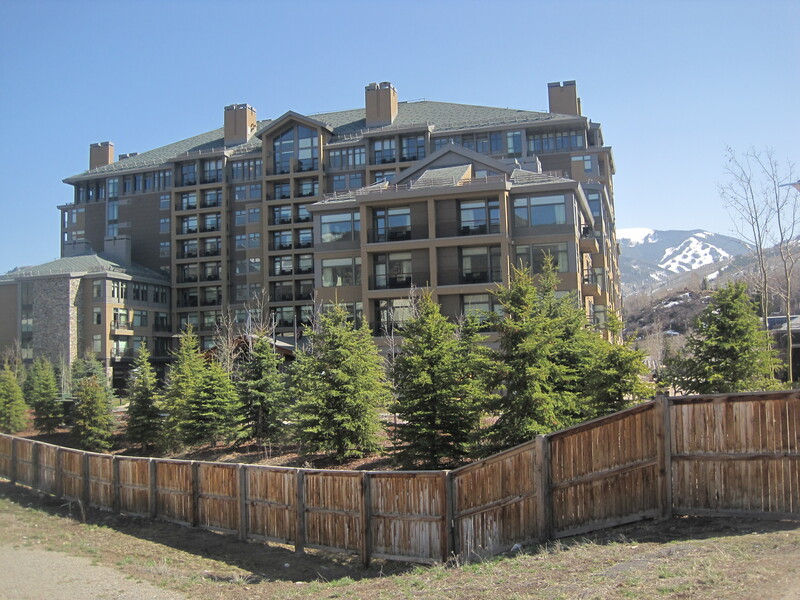 By Friday’s end, I had logged about 20,000 vertical feet of skiing, which meant I would be taking it easy on Saturday at Vail if I was to survive a half marathon on the following day. But perfect conditions, wide open bowls and tons of unexpected snowfall prevented us from skiing anything less than another 20,000 vertical feet (Jay put it best by saying it was “puking snow”). But all that would have its price: by Saturday night, my calves were extremely tight and my quads were very sore. In other words, that’s the first reason I was heaving every two steps at the first mile marker of my nineteenth half marathon. Those are some nasty hills. However, I knew about them going into the race so I adjusted my expectations accordingly. For those who are unfamiliar with Colorado geography, Fort Collins is about three hours away from Avon, where we were spending the weekend. 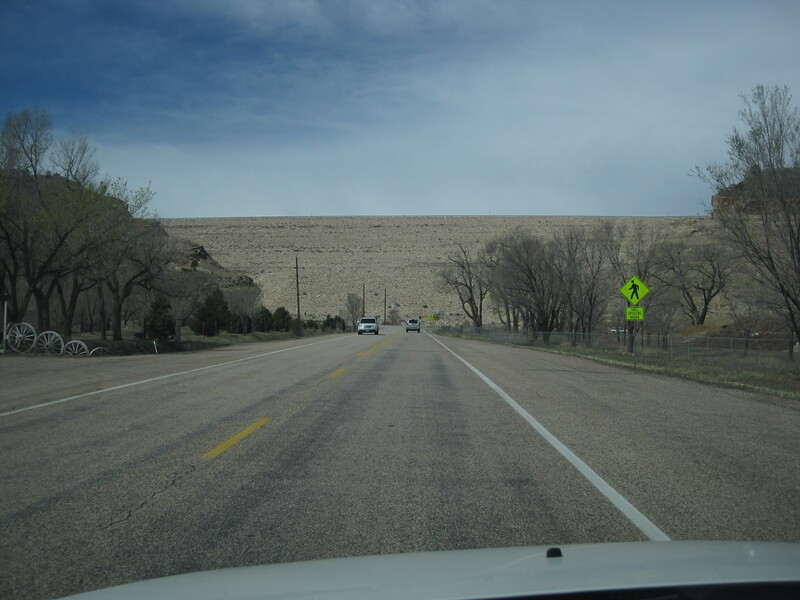 Similar to Denver, it sits in the shadow of the Rocky Mountains, with elevation going from flat to jagged very quickly. Any race in or around this area would be challenging, but given the chance to run a scenic, mile-high half marathon in cool, dry temperatures with the finish line at the New Belgium Brewery, who would say no? A lot of people, apparently. Jason, my trusty companion in half-marathons, was more focused on the slopes and our crazy Denver outdoorsman Jay Zeschin was also set on seeing the ski season to the very end. This meant a 3-hour drive at 4 AM with nothing but the open road, an eclectic mix of rock/metal albums and the imminent sunrise. 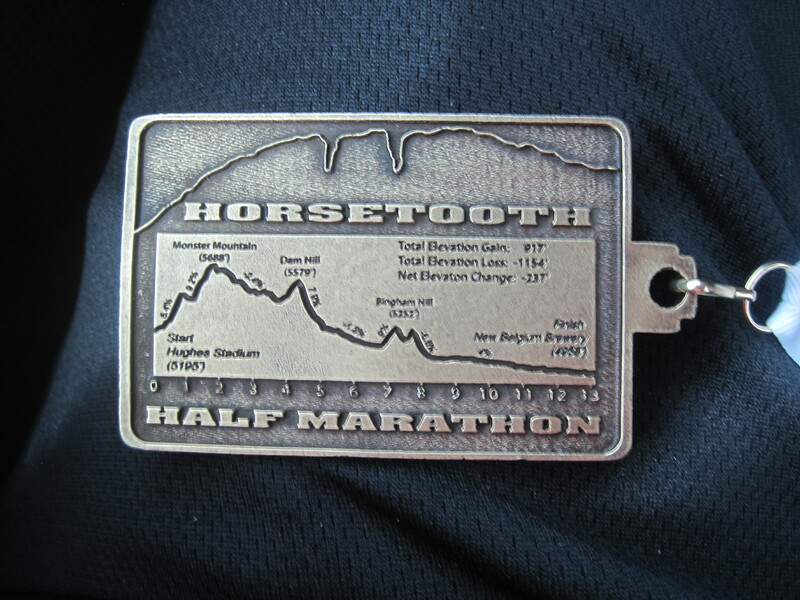 The Horsetooth Half Marathon started at Colorado State’s Hughes Stadium, 7 miles west of I-25 and just under one of the many rocky dams that surround the Horsetooth Reservoir. I arrived over an hour early, so I grabbed my bib and dashed back to the car for a power nap. Temperatures were perfect – in the upper 40’s with a cool breeze. Once 8:30 AM arrived, I was on Dixon Canyon Road, facing the slope of the steep canyon that we would soon be scaling. After a beautifully austere rendition of the Star Spangled Banner by a lone trumpeter, the race began its first ascent. And now we’re back to me, hobbling upwards, gasping for air with twelve miles left to go. 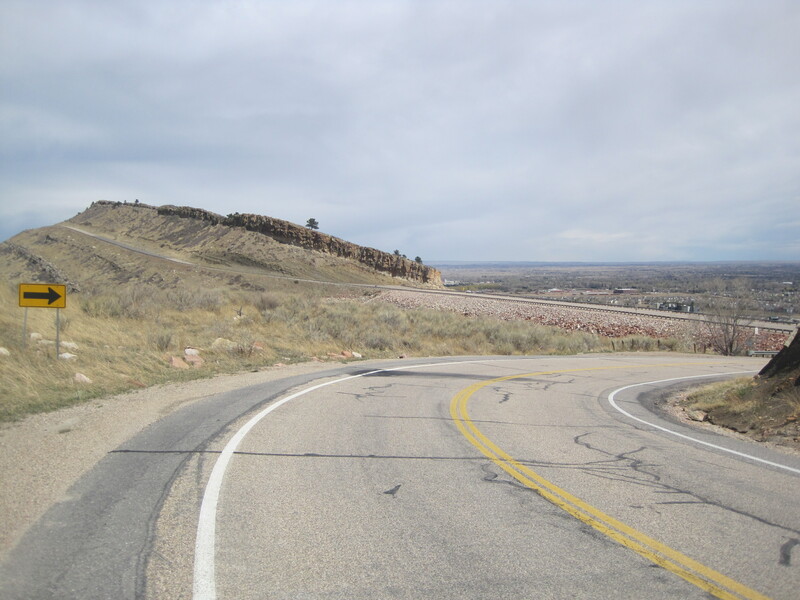 The first half of the race runs north on Centennial Drive, along the rolling edge of the Horsetooth Reservoir, which is a thin recreational lake that unites the flat and mountainous parts of Fort Collins. Right before climbing the second half of the first hill, appropriately titled “Monster Hill,” runners are treated to a spectacular view of the reservoir to the left and the vast sprawling plains of eastern Colorado to the right. I had only a minute to take it all in before I was forced onto the tips of my toes for the most grueling climb of the day. Even though I was only sixteen minutes into the race, by the time I reached Monster’s summit at just below 5,700 feet, I felt spent. Fortunately, I had two miles of downhill running to catch my breath and get my heart rate down to a level below life-threatening. While doing so, I noticed something peculiar. In most loud urban races, you get very few secluded moments where all you hear are running shoes plodding along the course. In this case, running along the ridge of a manmade lake, I could hear not only everyone’s footsteps but also their breathing. After all, we had all just scaled Monster Mountain together and we were all panting in unison. It was a pretty fun moment of athletic communion. But whatever transcendental feelings I felt were soon replaced by disorientation. The second climb of the day, Dam Hill, looked almost exactly like Monster Hill – both preceded by a thin, flat stretch at the top of a dam and then a steep climb up the west face of a mountain. It felt like being in a Twilight Zone episode, as if we were coming back to the same area despite running in a relatively straight line. Once past this hill, I faced the longest, steepest downhill of any race I’ve ever done, switching involuntarily to some dangerous heel striking to avoid falling on my face. Once past this sudden plummet, the course changes gears and cuts through bucolic pastures and the unmistakable odor of manure. Halfway through, the race banks southeast through more farms right before the third, last and least of the day’s climbs, Bingham Hill. It continues on Bingham Hill Road until detouring to cross over the Poudre River via a bike path. As we crossed over the river on a wood and steel bridge, I suddenly felt awkward and a little dizzy. My feet felt heavier than usual, as if gravity had increased its pull on me. But then I realized it wasn’t me, it was the bridge. The combined foot falls of hundreds of runners had caused it to wobble slightly up and down, which was confusing my stride. It was an odd feeling and I was glad to get off it and back on terra firma. At mile 11, the course meets the Poudre River on the left and more bovine bowel movements on the right, making its way towards the winding paths of Lee Martinez Park. Once there, you could feel everyone’s pace pick up as they began to feel the finish line approaching. After hugging Old Fort Collins Heritage Park, runners bank left over the Poudre River for the last 0.1-mile stretch. I crossed the finish line in 1:51:52, grabbed my medal and souvenir New Belgium pint glass, and made my way to the food tent. I wolfed down several orange slices, lost my water bottle, took a few pictures, and hopped on the buses to take me back to Hughes Stadium. On the way back home, I stopped in Denver to get lunch and briefly catch up with a friend from high school, Melissa Mora. 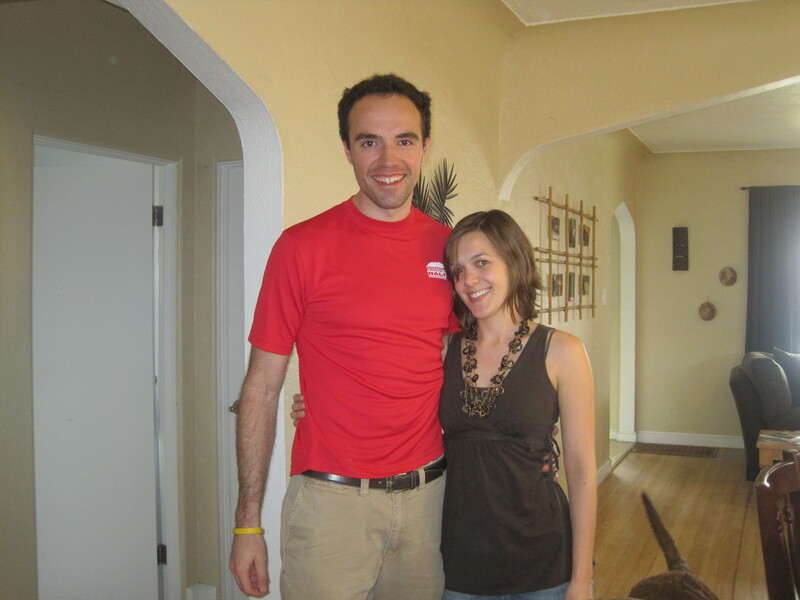 I last saw her in the summer of 2004, right before she left San José to study at CU-Boulder. During the delicious home-cooked meal, which was interrupted only by her dog Max begging for food by resting his jaw on my legs, we managed to sum up the last seven years of our lives in easily digestible nutshells (you can see Max’s tail in the picture on the left). Not only was it great to meet up with her, it was a fun distraction from the second 3-hour drive before me. I wish I could have stayed longer, but the rest of the day’s hours had been punctiliously planned and I had to get back to Avon in time for check-out … and the third 3-hour drive of the day. Fortunately, Jason was behind the wheel this time, so armed with his blazing speed we got back to DIA with plenty of time. Yes, I know, these race reports are getting a bit long. But if you’ve made it this far into the entry then I thank you for the interest, and at the same time pat myself on the back for somehow keeping you sufficiently transfixed. And now, with unnecessarily tight calves, I have two weeks until the Cincinnati Flying Pig and the definitive rematch between Otter and Laura. Stay tuned! Q éxito! Keep ’em coming, tight calves and all!! You’re entries are fun to read, I can easily picture everything you portray, say and do, and they’re always a welcome distraction!! And remember, when those calves are bugging you, it could always be worse: they could be bleating and hungry and waiting for you to muck out the corral!! :O! Good luck with the flying pig… if you’re on for the ride, hang on tight and don’t fall off. You’re becoming quite the farmer… :P! Good luck on your quest and thanks for sharing the link to your blog!